Are there toiletries littered all over your bathroom? Well, you're not alone! Many people just don't have enough storage space in their bathrooms to hold all of their knickknacks, whether it's products used daily or cleaning supplies used occasionally. Luckily, Better Homes & Gardens came up with a several quick fixes that anyone can utilize in their own spaces. If you have a bathroom vanity as opposed to a pedestal sink, the website suggests that you make the most out of the countertop. Opt for a tray or platter that can hold frequently used products like your combs, ear swabs and cotton balls. Another space that most people tend to forget is the floor. Choose a beautiful woven basket to hold your towels, extra soaps and accessories and place it next to the bathroom vanity or the shower. 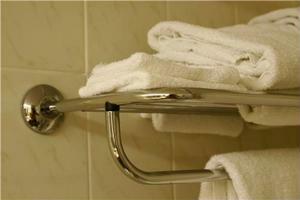 A towel rack is another space-saving way to add extra storage to the bathroom. If you have limited space, why not install the rack above the bath tub or next to the sink? And you don't have to use it just for towels either - the shelving units can be used for other things like toilet paper and other knickknacks.